With the #MeToo and #balancetonporc campaigns hitting the press in recent times, we might ask what lessons history has to teach us. Should we be wary of authors of high profile classics? Did Baudelaire have questionable attitudes towards women? In a series of blog posts in English and French, we will explore the question “Should feminists read Baudelaire?” Baudelaire himself seems to suggest we shouldn’t: «Ce n’est pas pour mes femmes, mes filles ou mes sœurs que ce livre a été écrit» (“This book was not written for my women, my daughters, or my sisters”). But is this really fair? In 1935, a French women’s fashion magazine published a piece on the types of men to avoid. It was in the magazine’s Sunday supplement—Mode du jour’s Dimanches de la femme. The author, Martine, advises women about the kind of man they should steer clear of, warning that such men don’t understand the “female heart”. Martine singles out a particular figure who typifies the kind of man she thinks women should steer clear of: that man is poet Charles Baudelaire. But if Baudelaire is the ultimate misogynist, in Martine’s view, what does that mean for all his female readers? Is Martine right? Can Baudelaire readers be feminists? As an all-female research team on the Baudelaire Song Project, we set out our position in a blog post published in French last week. 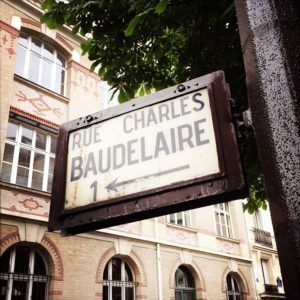 But we decided to ask the same question of some brilliant female Baudelaire specialists from across the globe: “Should feminists read Baudelaire?” Over the next few weeks, we’ll share what they have to say. From my first encounter with him, in Paris, sometime in the spring of 1968, Baudelaire has been a constant revelation and an enduring challenge. A revelation of the intensity of sensual experience through his poetry, and of the power of intellectual exploration in his responses to art, literature, and music. A challenge in his injunctions to women to be silent, in his misogynistic journal jottings, in his apparent conviction of the one-sidedness and transitory nature of love. But it never occurred to me that, as a feminist, I could just set him aside, refuse to read him and explore him because of his vision of women, which in any case I have always seen as too complex, too intensely personal, merely to be categorised under that all-too-easy label of misogyny. It’s not just that the influence of his writing has been too great to allow us to understand contemporary poetry if we seek to elide him from the record. It’s more that attempting to understand him within the context of his time and his personal experience is an exercise we reject only at the risk of blinding ourselves to our own prejudices, of becoming mired in contemporary habits steeped in bigotry because we’ve failed to understand how language and thought are contingent on beliefs we may not even know we hold. Of course feminists should read Baudelaire—we’re surely not going to allow our beliefs to box us into a tiny world where we explore only those things that reflect our own position, are we? If we do, how do we differ from the sexist, racist, ignorant minds we so deplore? ← Baudelaire était-il vraiment misogyne?